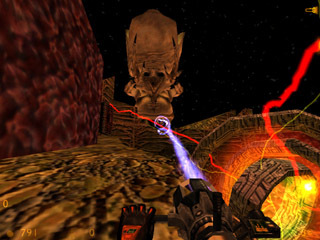 Here you can find information, images, links and downloads relating to video game development. This includes projects I have worked on, both commercial and independent. Also I would like to post other people's development work that I find interesting. 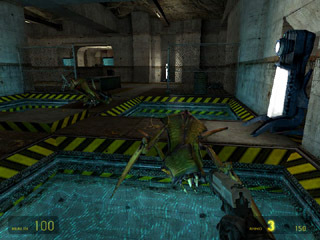 This screen shot is from Infinite Rift, the last of my single player Half-Life mods. Learning Half-Life 1 and its editor Worldcraft was the most important part of my development as a level designer. A series of early struggles lead to a string of successes which launched me into professional game development. I was working for 2015 inc when Half-Life 2 was released. I was afraid that my modding days were over because I was working professionally at that point. But 2015 downsized (shut down) and suddenly I had plenty of free time.In the time I was unemployed I created a single player mod and contributed to two multiple player mods. Above is a screen shot of Das Roboss. It was my only single player Half-Life 2 project and was very well received. This is a small Q3 Arena map I made but never released. I never officially released any Quake or RTCW maps but I did do a fair amount of editing. The tools, WC & Radiant, are basically the same as the Half-Life tools so I took a stab at editing these games. They remain favorite games to me, but I just didn't get into the editing as much as I did with Half-Life. I've been making games with Game Maker for years. Some people might not take it seriously but I've found it to be an amazing tool for prototyping ideas and learning. Using Game Maker I've learned to script inventory and combat systems, sidescroller physics, particle systems, basic A. I. and user interfaces. 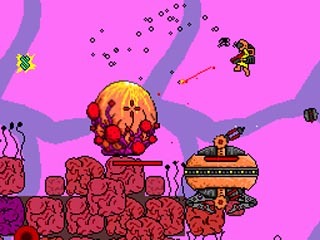 Probably my favorite GM project is Miner 21 where you explore the cellular workings of a giant planet-eating space monster. The world of professional video game development is very different than modding or developing as a hobby. Professional development requires that you produce a product that people will actually buy. Schedules and budgets are tight and failure means unemployment. That said, I couldn't imagine doing anything else for a living. 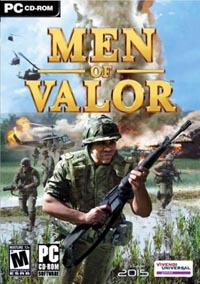 Men of Valor is a historical first person military shooter set in the Vietnam War. It was made by 2015 inc, published by Vevindi Universal Games and release on Xbox and PC. I am credited as Level Designer in the PC version of Men of Valor. MoV was the first professional title I worked on. I was hired by 2015 in the final six months of production to help with the PC version of MoV. Working at 2015 was a great experience that was all too short. I met a lot of great people who have helped me out in the years since. In 2005 I moved to New Jersey to work at N-Fusion Interactive. 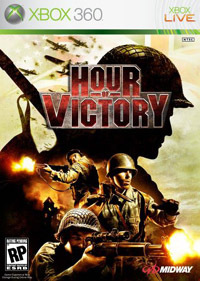 The project that we started would eventually become Hour of Victory. 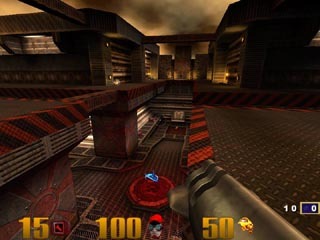 Originally designed as an open ended military FPS for PC, HoV went through many changes. As the project progressed our design changed dramatically to meet changing expectations. Our platform was switched from PC to XBOX 360 and all of the levels were remade from scratch. I am credited as Lead Level Designer on HoV and am very proud of what I learned and accomplished throughout development. Here is a shot of the Okadian Isles, the second environment featured on my reel. This is not a professional video game project. This is the demo reel that I created after graduating from Full Sail in December 2003. It has was a key tool in my post graduation search for employment. 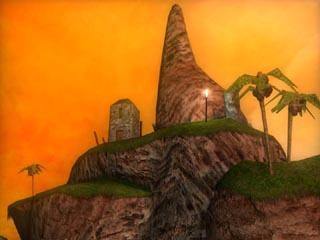 The reel features three environments and a couple minor characters. I modeled, textured and animated everything in Maya. The reel was composited in Shake. Here are some sketches, flash movies and other stuff I wanted to post. 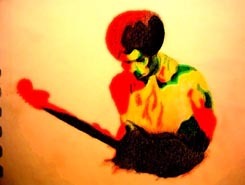 Color pencil drawing of Jimi Hendrix based on the Band of Gypsies CD cover. I've never been a great artist. Most of my traditional art skills are targetted toward visual communication. I can draw pretty much anything and it will look correct. I draw quickly, usually with a pen in a lined spiral notebook. Occasionally I draw on sketch paper and try to make nice renders. I don't do this very often. At Full Sail I learned to do a lot. One of the skills I picked up was character modeling, rigging and animation. I mostly work in game and level design, so this skill is not used very often. Thus it remains undeveloped. But knowledge of character creation and animation is helpful when working on a team of artists and programmers. 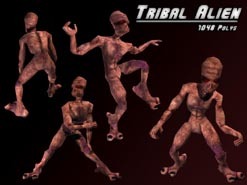 Tribal Alien, appears in my demo reel. 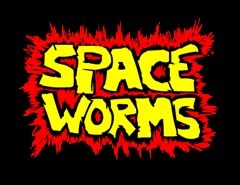 Space Worms is part one of an unfinished science fiction short. I learned Flash around the same time I was creating the original TYLAK.COM. But I found most Flash based website extremely annoying and vowed to never make a Flash site. That said, I love Flash as a movie/game tool. My knowledge of Flash is pretty basic and restricted to cartoony movies and simple games.